me the funds to help a small pitbull rescue tomorrow. Some previous prints have gone to a local shelter and a couple other rescues. I have been Santa's elf packing up prints today. 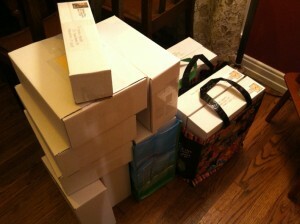 I am a VERY very small business, so this amount of shipping all at once is crazy. You can see the Freedom print here: https://www.etsy.com/listing/152206795/freedom-signed-11x14-giclee-print-to? I am thinking of a new painting for this purpose. Waiting for a dog or kitty face to give me the right idea.